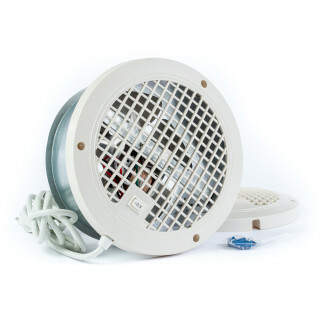 Brand: ThruWall Electrical Rating - 40 Watts Safety Rating - UL Listed 8" Hole Diameter The ThruWall™ can be mounted in any normal drywall or paneled stud construction wall with a 3-3/4"" to 6-1/2"" total thickness. Telescoping metal sleeve with plastic grille attached. 4.65 pounds 9.2 x 6.5 x 9.2 inches"